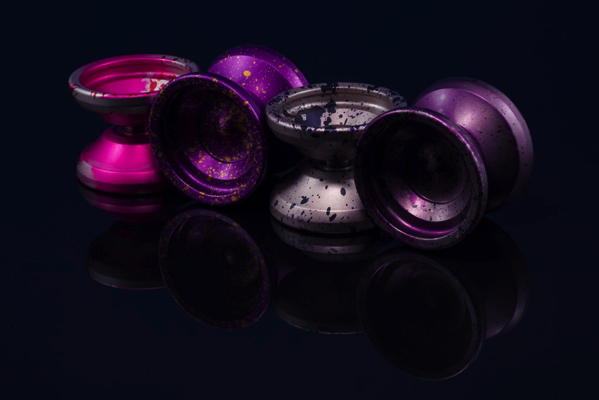 YoYoExpert Blog & Yo-Yo News – New Collaboration from One Drop X OhYesYo! The Set Up: This project started as a camping trip to Marty Coatney’s farm in Lebanon, Oregon. He invited a bunch of yoyoers and others to the land to see the 2017 solar eclipse. Andy Kenst (a yo-yoer who lived in Oregon near One Drop) and myself had been building a friendship and he helped fund a project of mine earlier that year and was like “Coffin, you gotta come see this man.” Apprehensive as I usually am, I explained I’d try to make it. A week later Andy messaged me and said “Hey, I got you a plane ticket – see you soon lol.” From that point on it was all great – I’d never been to Oregon and I was beyond hype. Andy joked about collaborating with One Drop and I said if they’re interested I’d gladly draw something up on the spot. The Eclipse: Fast forward a bit and I’m in Eugene, Oregon. Marty comes to pick me up from the airport and we head to his house. This is really my first interaction with Marty and we get along immediately. I met his family as well and got his son into skateboarding which for me felt amazing. Andy and I finally meet face to face and the party begins. Lots of fun and festivity at Marty’s place as people begin coming in to set up camp. I successfully broke and repaired his dad’s 4×4 which bridged a gap between me and his dad. There were lots of great folks at the farm. Beerlunch: Andy says “hey dude, let’s make a trip to One Drop”, so I grab my backpack and we’re outta there. I arrive and finally get to meet the One Drop team and they are arguably some of the chillest people ever. I proceed to go observe the machines in their factory that I’d obsessed over in the background of several videos. Spotted Victoria (One Drop names all of their machines) and snapped a photo of it. Having some background in robotics I just wanted to observe them while they worked to learn as much as I possibly could. Deep States and Trilliums were going out this weekend so I offered my help if it was needed, but everyone wanted me to enjoy the trip more than anything. We left the shop and walked to get some beer and food nearby (might’ve been the greatest beer I’ve had) and then an ice cream shop where I had to be educated about what an Affogato was (ice cream with espresso poured over it) – so good. We came back and sat at Shawn’s desk and he says “you wanna make something?” I reach for my mini notebook and sketch up something that looks like it would be fun. I’ve always been biased to mid weight over direct center or rim weight. After about 20 minutes of very minor tweaks for aesthetics and what not, we had something that resembles a damn good yoyo. Throughout the weekend I come back and forth to the One Drop factory to hang out and play with the massive collection of Yoyos available there. It’s Alive… It’s ALIVE: Months later I receive a photo of the most gorgeous matte grey yo-yo that tells me it’s Everything I wanted it to be. A few days after that, the Eclipse protos arrive at my house and just in time I take them to the East Coast Masters yo-yo contest and it’s an instant hit – everyone was hooked on them. From that point on, people have been asking when or where they could get one. July comes up and I’m at Nationals with one Eclipse and it’s getting passed around profusely and it strikes me again everyone loves it. Markmont claims it was incredibly smooth for the way it looked. I’m very pleased with this knowledge. RELEASING 12/3 @ 8PM EST!